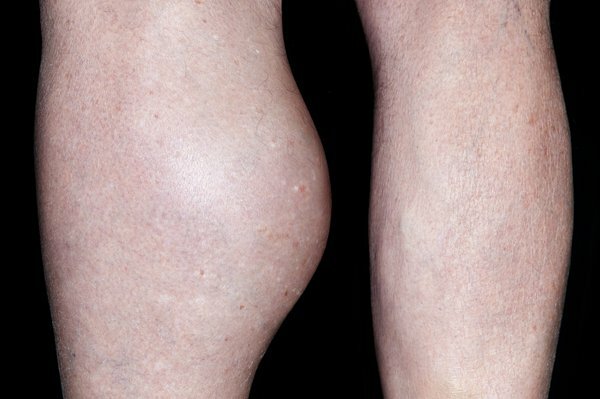 A Baker's cyst, also called a popliteal cyst, is a fluid-filled swelling that develops at the back of the knee. However, sometimes a Baker's cyst may not cause any symptoms other than the fluid-filled swelling at the back of the knee. In rare cases, a Baker's cyst can burst (rupture), resulting in fluid leaking down into your calf. This can cause sharp pain, swelling and redness in your calf. Knee damage caused by a sports-related injury or a blow to the knee can lead to a Baker's cyst developing. Baker's cysts are more common in women than men, probably because women are more likely to develop osteoarthritis and rheumatoid arthritis. They usually develop in people aged over 40, although can affect people of any age, including children. See your GP if you have a cyst that's causing problems and doesn't clear up on its own. They'll usually be able to diagnose a Baker's cyst by examining the back of your knee and asking about your symptoms. Your GP will ask you whether you have any associated health conditions, such as arthritis. Further tests may be recommended to rule out other more serious conditions, such as a tumour, an aneurysm (bulge in a section of a blood vessel) or deep vein thrombosis (DVT) (blood clot in one of the deep veins of the body). You may need an ultrasound scan or a magnetic resonance imaging (MRI) scan. Treatment won't usually be necessary if you have a Baker's cyst that isn't causing any symptoms. Painkillers such as parcetamol and ibuprofen can be used to reduce the swelling and relieve any pain. Bandages or an ice pack may also help. A bag of frozen peas wrapped in a tea towel works well as an ice pack. If you have an underlying condition that's causing your cyst, it's important that the condition is properly managed. The cyst may disappear when the condition causing it has been treated. In some cases, it may be possible to drain the cyst. Surgery may also be needed to repair any significant damage around the knee joint. Read more about treating a Baker's cyst.